Junk Bucket Dumpsters are perfect for almost all junk and debris situations. 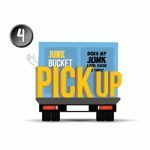 Whether you have household junk or yard debris at your home, or construction trash or office furniture at your office, The Junk Bucket can help. 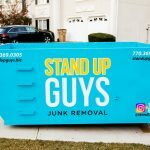 There isn’t a better dumpster rental service in Atlanta!Do you ever find yourself in junkie situations? Situations where you have more junk or debris than you know what to do with? Well if this sounds like you and you live anywhere in Metro Atlanta, then I have the perfect solution to all of your junkie issues. The answer is The Junk Bucket! The Junk Bucket is simple. It’s a light weight, driveway safe, light blue, ascetically pleasing, awesome dumpster that you can use to throw away all your junk. 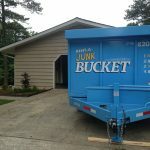 Junk Buckets are sleek in design, this way they can fit into small spaces that other big ugly dumpsters cant fit into, like smaller Atlanta driveways or side yards. It’ much easier to carry your junk out to a dumpster when it’s close. Nobody likes dragging junk from inside their house all the way to the street (where most large dumpsters must be dropped). Ordering a Junk Bucket Dumpster is simple as well. 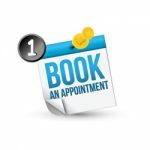 All you have to do is pick up the phone and give us a call at 770-369-0305 or you can even book online. When you call in just let us know when and where you want the dumpster, and we’ll have it there for you in no time. We’ll work around your schedule. You’ll receive a courtesy call 30 minutes prior to it arriving as well, this way you know when it’s on its way. 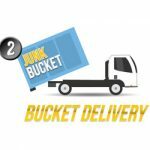 Once the Junk Bucket is safely dropped in the exact spot you like, then it’s just time to get to work. Another great perk about renting a dumpster, over other types of services, is that you can work at your own speed. You can keep a Junk Bucket Dumpster for 1 day or 5, it’s up to you. Just take your time and fill the dumpster at your own speed. It’s a perfect scenario for the DIYer’s out there. 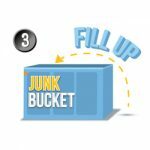 You can also get rid of pretty much ANYTHING with a Junk Bucket! You can throw away old furniture, appliances, yard debris, electronics, old tools, hot tubs, you name it and you can chuck it into a Junk Bucket. So don’t hesitate, just get rid of it. It feels so good after all! 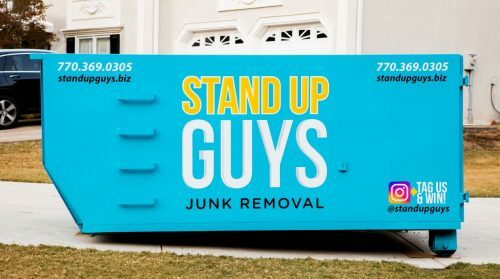 Once you have worked at your own speed and finished getting rid of all the junk you wanted, just pick up the phone and give The Stand Up Guys a call. We’ll come right out and haul the Junk Bucket away! It’s all really that simple. You can watch as we drive away with all the junk that was bogging you down just days before. 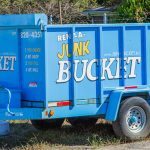 Doesn’t get any better than The Junk Bucket!